Stuffed animals are getting smart. This has been going on for a while now, fueled by the raging success of Tickle Me Elmo. Each generation of these toys sports increasingly interactive elements. 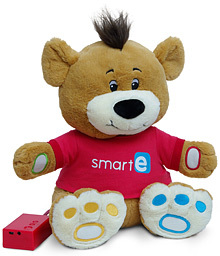 The Smart-E-Bear from Kids Preferred is no exception. If he's so smart, how come he's not wearing any pants? As he's designed for small children (2+ years), Smart-E-Bear's controls are simple: just squeeze the toy's hands or feet. This allows kids to choose from a variety of activities. Smart-E-Bear tells stories, plays songs and games, and-get this-is bilingual! He can even say your kid's name-which kind'a creeps me out a little. It reminds me a bit of the stuffed bear robot in Spielberg's A.I. (an underrated film, in my opinion-you should check it out sometime). I relaxed a little when I found out that this is done by an installed list of names-not through magic. Though preloaded with content, parents can choose from a variety of activities offered by the bear through a simple connection to a PC with the included USB cable. According to one user, 90 minutes of content barely takes up 10% of Smart-E-Bear's storage capacity. Imagine how much fun your kid could have with this thing all loaded up! The Kids Preferred web site provides even more content for Smart-E-Bear that can be purchased via PayPal or credit card. Toys like this are becoming commonplace among small children-and with good cause. They're cute, they're cuddly, and they're educational. And I, for one, couldn't ask for more in a toy. Snag your very own Smart-E-Bear at Amazon. Get Inspired @ Innovation Uncensored 2013 In NYC!